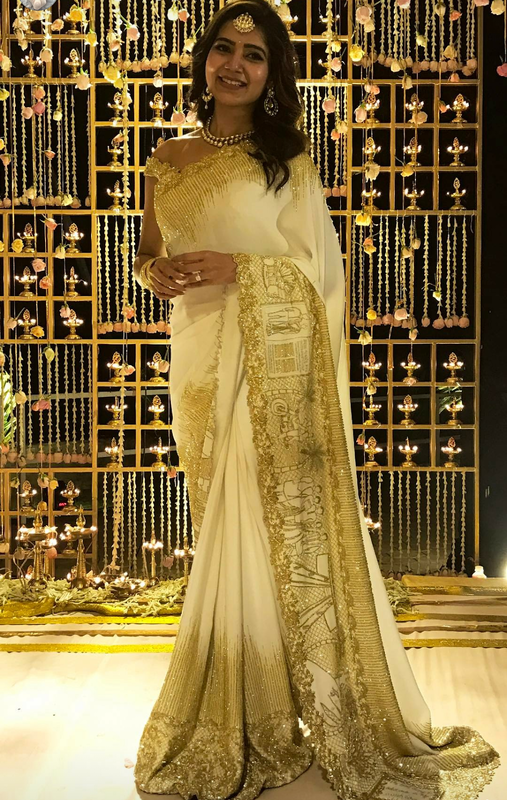 I am a big fan of Samantha Ruth Prabhu's style game and when there was buzz about a possible engagement of this south actress I was totally looking forward to see what see wears. And I wasnt disappointed one bit. I love Telugu movies as they are totally my kind of entertainment (masala overload!) 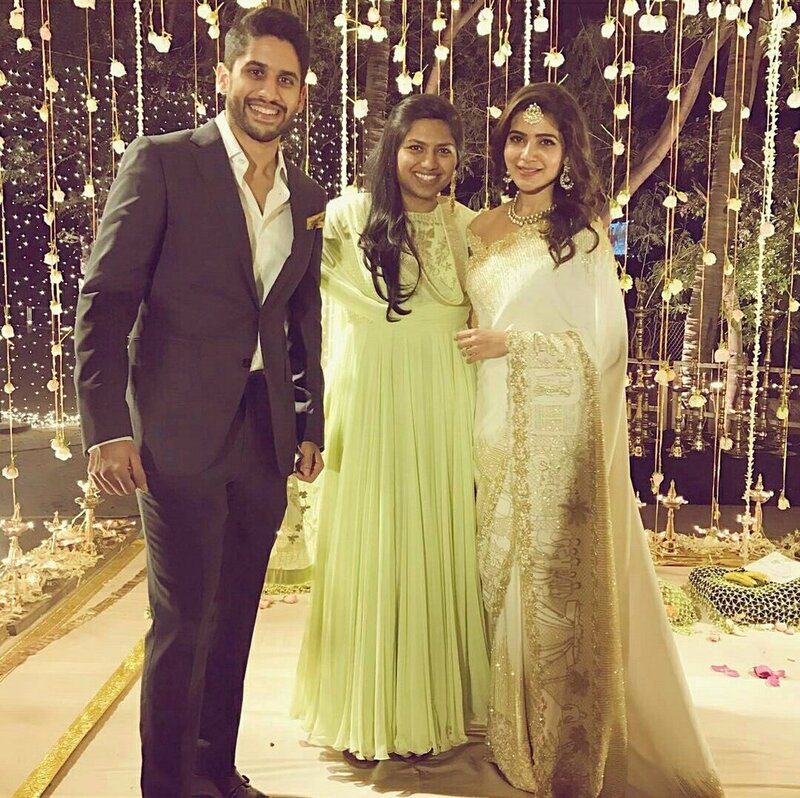 and I have watched a couple of movies of Naga Chaitanya and Samantha Ruth Prabhu but I had no idea these two were actually dating each other until recently. 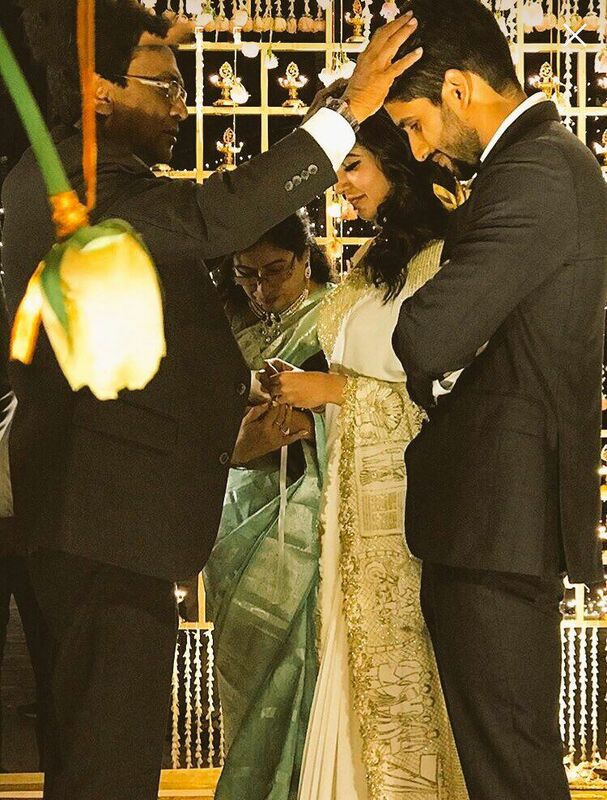 But now they have decided to make it official with a picture perfect private engagement ceremony in Hyderabad early this week. 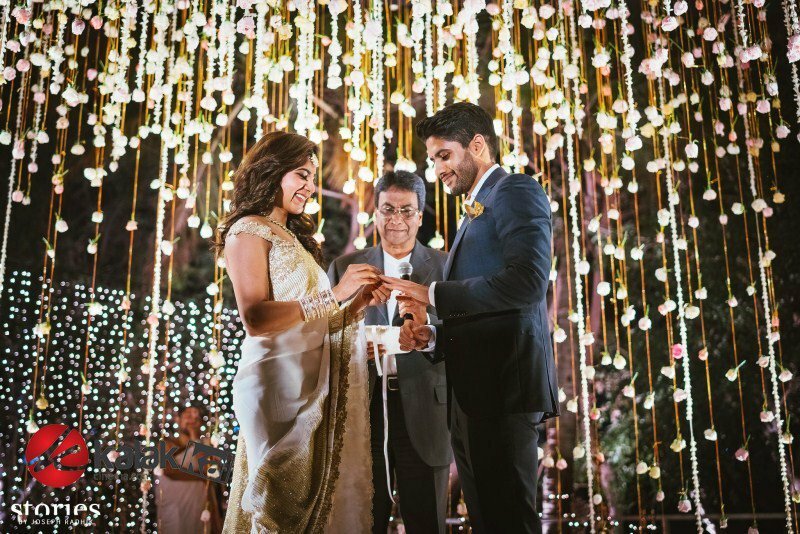 The buzz is that the couple Naga Chaitanya and Samantha who are lovingly called #ChaiSam by their fans will have their wedding this year in July or August. The telegu actors starred together in super hit film “Ye Maya Chesave” but they fell in love while filming “Auto Nagar Surya”. Later #ChaiSam also did “Manam” together which featured 3 generations of Akkineni family. 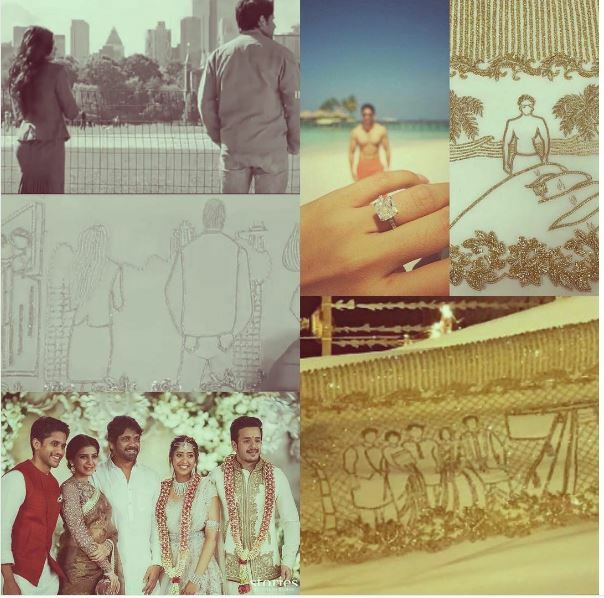 Bride to be Samantha wore a dreamy custom made Koecsh sari which had #ChaiSam love story embroidered on its border. How super cool is that? I love this creative idea of depicting a couples journey in the engagement outfit making it a timeless piece to be treasured for a long time. I also love how simple colurs were used to make the embroidery stand out. The off shoulder blouse is another work of genius lending the outfit a contemporary touch. The saree look was accessorized with a necklace, earrings, Mang tika and gold bangles. Open hair and a huge diamond ring finished out this look. The groom to be Chaitanya looked dapped in a blue suit and co-ordinated with samntha with a gold pocket square. This innovative idea of embroidered love story as been done before by the designer Koecsh’s Kresha Bajaj at her own wedding. Take a closer look into samantha's saree embroidery. 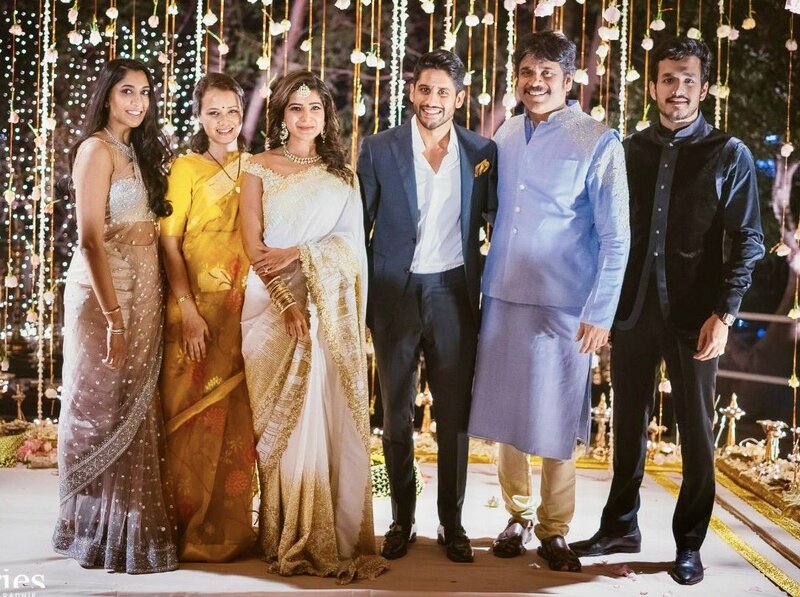 Family pose with Naga Chaitanya and Samantha at their engagement. Love what Amala Akkineni is wearing. I love how gorgeous and happy Naga Chaitanya and Samantha looked. Congratulations to them.